Watch The Silence trailer: Like A Quiet Place but... creepier. 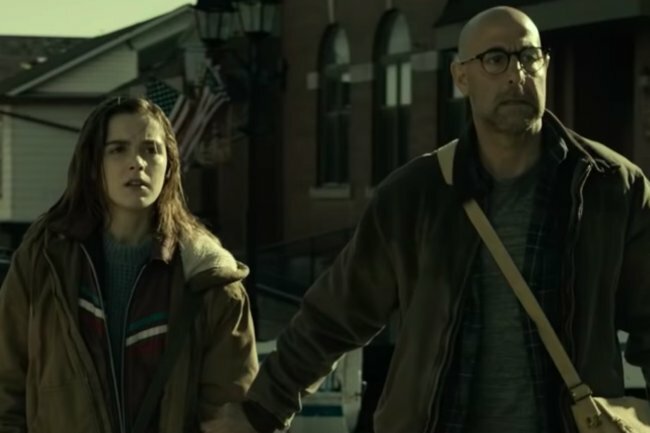 Get ready for Netflix's The Silence, which is basically A Quiet Place meets Bird Box. If your list of apocalyptic thrillers has dried up, you’ll soon be in luck. Netflix’s The Silence is being released on April 10, and we are getting Bird Box and The Quiet Place vibes. Watch the trailer for The Silence below. Post continues after video. Starring The Devil Wears Prada’s Stanley Tucci and Chilling Adventures of Sabrina’s Kiernan Shipka, the film follows a family’s fight for survival as the world is attacked by monsters in the form of terrifying bats. They prey by sound, so the characters need to stay completely silent. Ally, who is 16-years-old and deaf, has a definite advantage. But when she seeks refuge with a family in remote America, she discovers a cult intent on making the most of her heightened senses. The Silence is by the same director as the horror film, Annabelle, so… it will be terrifying. I will watch every #thequietplace every #BirdBox not even bothered that #TheSilence is another angle of that, give them all to me. Yeh, I get that #TheSilence bears similarities to #AQuietPlace but have people really never noticed how “when something becomes popular similar things appear”? Round up your mates, because you won’t want to watch this alone. Oh, and don’t scream too loud. They might… hear you. The Silence drops on Netflix on April 10.